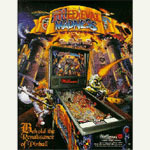 Factory-original color sales/promotional flyer for the original Williams Medieval Madness pinball. 2-sided, new condition. Limited number remaining.